It is this condition of the heart that is described by the parched, cracked and broken looking portions of the heart on this painting. 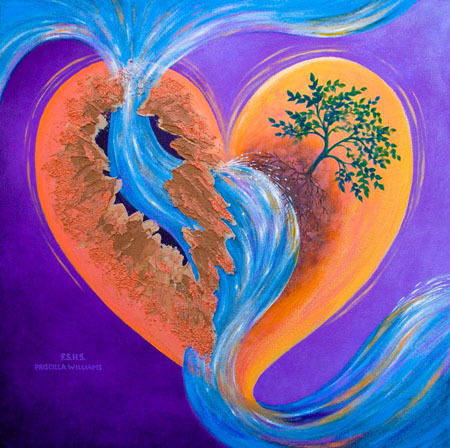 When one has opened up their heart, the deepest part of their being, to Jesus Christ (Yeshua ha maschiach) – to the One who is the River of Life, there is not only hope in that part of the heart but much growth and fruit in the depths that spills out to all. Once this level of relationship with Jesus has taken hold there is a recognition of the sufficiency and abundance of our God. His goodness becomes seemingly visible and tangible. Fears wash away. Surrender turns to sweet release. One no longer is preoccupied with protecting their own heart. One becomes free to flow in ultimate trust in God, not preoccupied with trying to gain favor with others. Sweet surrender is a life-long process. Jesus is in that process, soaking us with Truth and Grace, setting the captive free.